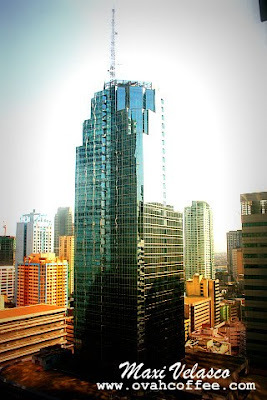 Makati City is considered as the commercial and economic district of the Philippines. 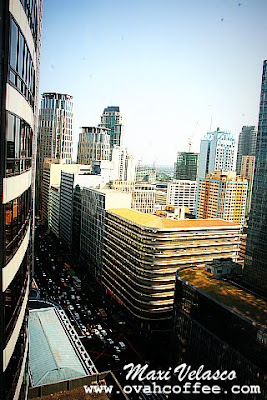 The city is home to the Philippine Stock Exchange, the Makati Business Club, five-star hotels, first-class shopping malls and... traffic! The last time I've been to Makati City was in March of this year. Madde [my boyfriend's younger sister] has rebooked her return ticket to Sweden in order to fly home with me. Cathay Pacific's office is located along Ayala Avenue which isn't that hard to find. The only two problems we've encountered during our visit are the heavy traffic and the difficulty in finding a good parking area. Here are a few photos which are taken from the 22nd floor of the LKG Tower [the Cathay Pacific Office]. The view from up there is truly captivating! Anyway, our day which started well ended well. Thanks Nova for always dropping by here. Yup! Very heavy traffic. Yayks! I love the photos, too!